Disclaimer: I am not a dance critic nor do I play one on TV (I usually appear as a film historian and critic, which is what I am). So minus this training, you can take my two cents worth for what it’s worth. My personal main interest is that the Malpaso Dance Company is from Cuba, that little country that can, and my long standing interest in that island nation. 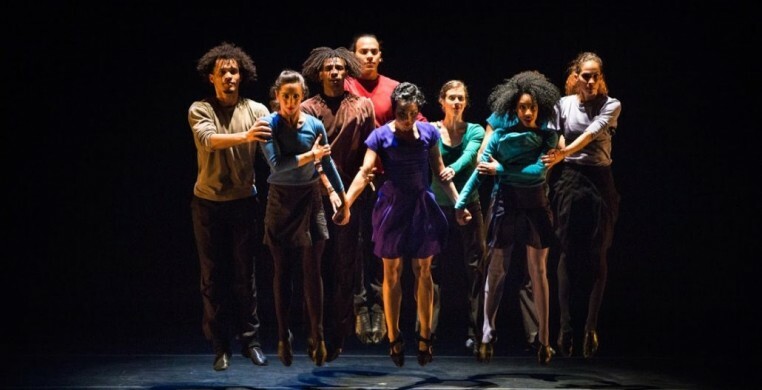 As limited private enterprise comes to what is no longer “Castro’s Cuba” (per se), the Malpaso Dance Company moved away from state subsidies and independently formed in 2012 (hence the name “Malpaso”, which means “misstep”). According to press notes, the contemporary dance troupe of 11 hoofers is among the Caribbean country’s “hottest,” combining various dancing styles, including modern, ballet, jazz and urban. The dancers presented four numbers in a short program of only about 90 minutes, including intermission, at the Wallis Annenberg. The music was presumably taped and the set bare - I suppose 60 years of imperialist embargo and little or no state funding will do that to your budget. The first dance was an adaptation of renowned Americano choreographer Merce Cunningham’s “Fielding Sixes”, with music by minimalist John Cage. The female dancers were clad in sky blue tights and leotards while the men’s similar outfits were burgundy; all were barefoot. They varied in number onstage. Much of the recorded music sounded literally like fiddling about, and the dancers often moved about in a herky-jerky manner, like puppets on strings. The second number, “Ocaso”, was far superior and in my estimate, best of all. Osnel Delgado, a tall, slim, balding bearded man who is a Malpaso founder, artistic director and choreographer (in fact, much to Delgado’s credit, he choreo-ed this splendid rendition), wore a tight form fitting button shirt with rolled up long sleeves and red bell bottom pants. Delgado performed a sensuous pas de deux with Daile Carrazana, who if memory serves correctly was wearing shorts. The taped music - which included Autechre’s spacey sounding “Parallel Suns”, “White Man Sleeps, Track 2” by Kronos Quartet and “Sunlight” by German-born British composer Max Richter - featured some violin playing, as the duet alternately embraced, caressed, rolled about on the stage floor and indulged in some fancy footwork. Overall, “Ocaso” was a delight to observe, full of verve and passion. After another curtain drop and lifting of the lights, the third number “Ser (Being)”, choreo-ed by company member Beatriz Garcia (reportedly her first such effort to be staged), was performed, with some of the dancers clad in tank tops and shorts. The dancers displayed their sheer athleticism and nimbleness to Ezio Bosso’s music before the curtain lowered again for intermission. The second act, such as it was, consisted solely of Israeli choreographer Ohad Naharin’s “Tabula Rasa”, with music by Arvo Pärt (the Estonian composer’s first name seems misspelled in press notes - well, it’s Baltic to me!). The entire collective scampered about the stage in modern dress, accompanied at times by strident strings. The entire program was over and out by 9:09 p.m., although there was a talk-back afterwards with the artistes. Malpaso Dance Company performs Friday, March 29 and Saturday, March 30 at 7:30 p.m. in the Bram Goldsmith Theater, Wallis Annenberg Center for the Performing Arts, 9390 N. Santa Monica Blvd., Beverly Hills, CA 90210. For info: (310)746-4000; http://thewallis.org/inspector. co-authored the third edition of “The Hawaii Movie and Television Book” available at: https://mutualpublishing.com/product/the-hawaii-movie-and-television-book/ .